Sometimes it's good to know ‘what not to buy’ – right? VPNMaster failed so completely, it found new areas of failing that we didn't even know existed. Avoid, under all circumstances. VPNMaster claims to be a US-based security company which has been providing proxy services since 2005. The product range is simple: there is just a single level of service which can be billed monthly at $7.95 (£6.12), quarterly at $5.95 (£4.58) per month or annually at $3.95 (£3.04) per month. The website provides little information about the service, and what you get are mostly ‘trust us’-type promises, including "we assure you that we offer the best prices", "we offer the fastest VPN service in the inds [industry, presumably? ]", and "we can unblock any site for you" (we'll bet they can't). When the site does get more specific, the situation only gets worse. You get 'military grade security' is one proud boast, which actually means 128-bit encryption, when almost everyone else offers 256-bit. None of this boded particularly well or filled us with enthusiasm, but we’re here to review the service – and so let’s explore further. If you've ever wondered why you should read terms of service pages, browsing VPNMaster's version will explain all. Here's just some of what we found. The service does maintain log files. These aren't used "for monitoring or censoring your internet activities", rather they’re for "monitoring server performance, identifying software bugs, identifying any potential security breaches, and for the purpose of identifying abusive users." The company doesn't say what's logged. The company may throttle your bandwidth if you transfer more than 2GB per day (probably less than a full HD movie). Simultaneous connections from different devices are not allowed. To sign up you must provide your physical address and phone number. And hey, look at this: "You agree that we can verify your mobile phone number by verification SMS." Sounds reasonable, right? If you're dumb enough to continue, or you have to review the product as it's your job, you'll reach a signup form where you're asked to enter your name, email address, phone number and physical address. Privacy and anonymity clearly aren't high on VPNMaster's priority list. "This order form is provided in a secure environment and to help protect against fraud your current IP address (141.101.107.41) is being logged." That wasn't our IP address (it seems to belong to Cloudflare.) Presumably that's more an issue for VPNMaster than its customers, but it still maintained the general feeling of clueless incompetence. We tapped a link to the Client Area. This was managed by WHMCS, a software platform normally used by web hosting companies, and unsurprisingly, VPNMaster had barely made any changes to it at all. There was a Downloads section, for instance, but you had to go looking for it in the Support menu, and it didn't have any real downloads. And when we clicked the Portal Home link, we were presented with an 'Order Hosting' link. Fortunately, an email quickly arrived with links to Windows and Android clients, and some manual setup instructions. These looked suspicious as for some reason VPNMaster was obscuring them with Mailjet links ('http://xp62.mj.am/lnk/AMEAAC...' etc), and it didn't help to find the company was hosting its Windows client as a shared file on a Dropbox account, but... We downloaded it anyway, because that's just who we are. A VirusTotal check gave us three hits, but nothing we would consider critical. The file wasn't signed, so Windows Defender complained about it, but we installed the client without difficulty. On launch the interface displayed a list of servers, supposedly with ping times, although many of these were displayed as '9999'. Closer investigation suggested these no longer worked. Connecting doesn't work as we would expect. Double-clicking a server in the list has no effect; you must select something and click the Connect button. Our two supposedly working UK servers failed to connect at all. And there are no notifications of any kind, so if a connection does fail, the interface doesn't directly warn you of that. Would the Settings box reveal any bonus features? Nope: there are no settings. What you see is what you get, there's nothing more. Normally we would run in-depth tests on a VPN's performance, whether it could unblock Netflix, and so on. In this case, as we were losing the will to live, we checked the speed of the Netherlands server only, and found it barely managed 10Mbps. A decent VPN might give us 30-50Mbps or even more, so this, like everything else about VPNMaster, was feeble in the extreme. Useless website, PPTP-only connections, poor speeds, just one connection allowed at a time, and they don't want you to use more than 2GB a day? 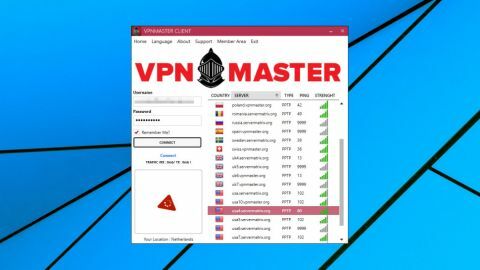 VPNMaster doesn't look like a company that deserves your trust, or your money. Walk away, and don't look back.